FILE - Pakistani traders protest against U.S. President Donald Trump in Peshawar, Pakistan, Jan 5, 2018. Pakistan’s defense minister says his country’s deteriorating relationship with the United States has led to a decline in the security and intelligence cooperation between the two allies to an almost non-existent level. Cooperation between the two allies increased in the aftermath of the attacks on the United States in September 2001 by al-Qaida terrorists based in Afghanistan. But in a Voice of America interview, Defense Minster Khurram Dastgir said recent harsh and very public criticism from Washington has contributed to a decline in the relationship. Pakistan and the United States have been increasingly at odds since last August, when the administration of President Donald Trump announced its new South Asia policy. Trump promised a new, tougher approach toward Pakistan. Washington accuses Islamabad of providing safe havens to Afghan Taliban, who are fighting the Afghan government, as well as U.S. and NATO forces. Pakistan denies the charge, saying it has cleared out all safe havens on its territory after a military operation that began in 2014. Earlier this month, a State Department official, speaking on background, told reporters that although U.S. officials believe both countries are committed to improving their relationship, Pakistan must take additional steps to address longstanding U.S. concerns about militant groups operating in its territory. 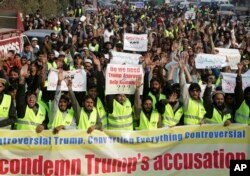 FILE - Supporters of Pakistani religious groups rally against U.S. President Donald Trump in Lahore, Pakistan, Jan. 2, 2018. “We believe that there is significant evidence that leadership of the Haqqani Network resides inside Pakistan and is able to plan and execute from Pakistan attacks inside Afghanistan. So the disagreement is much more about those facts than it is on our overarching goals in the strategy. And we need them to address these sanctuaries in order for us to be able to be enabled to succeed in Afghanistan,” the official said. The level of mistrust in some security matters was apparent as early as May 2011, when the United States launched a surprise raid on al-Qaida leader Osama bin Laden's secret compound in the Pakistan enclave of Abbottabad, not far from a Pakistani military academy. U.S. officials said at the time Washington did not share plans of the raid with officials in Islamabad out of concern the mission would be compromised. Previous public comments by Dastgir about a suspension of security and intelligence cooperation with the United States sparked little reaction from U.S. officials in Islamabad, who said they had received no such notification from the Pakistan government. “This expectation that somehow a notice will be delivered from the Ministry of Defense to the U.S. Embassy that hereby we are stopping intelligence cooporation, that’s not going to happen because it didn’t begin with a notice that hereby we are beginning intelligence cooperation,” Dastgir said. Still, Pakistan continues to allow the United States to use its territory to re-supply its troops in Afghanistan. It’s a card the country’s leadership said it might use if needed but not without serious contemplation about the possible consequences. The U.S. has limited choices when it comes to supplying its troops in this region. The alternatives require dealing with either Iran or Russia, two countries that have a worse relationship with the U.S. than even Pakistan.